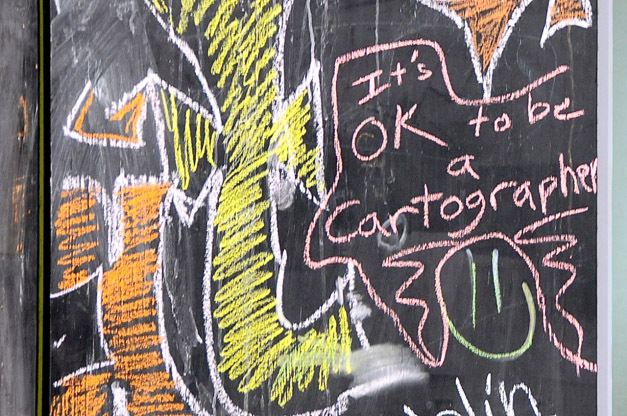 President’s Blog: It’s OK to be a Cartographer! In my opening address at the International Cartographic Conference 2013 in Dresden, Germany I argued, that there is quite some confusion about the status, relevance and importance of Cartography. While the term “map” is most popular and sees its arrival in big business debates amongst major software companies, in mass market applications related to new technologies such as mobile devices or in the mass media, the term cartography provokes the question “Is that still around?” It is more likely that those, who are involved in making maps nowadays call themselves not a cartographer but rather something else. I argued further, that the enormous relevance of the ever growing amount of geodata and geoinformation can only be “unleashed” when it becomes accessible to human users. To make geodata and geoinformation accessible to human users means to try to package it in a way that it can be perceived, “digested” and used, thus simply communicated. I argued further, that this was and is exactly the aim and contribution of cartography. Maps are most successful in being the interface between spatial data and human users. They order information based on the spatial attribute, they engage to explore, the can be entertaining, they help to become spatially aware, they tell stories, they help me to position myself in a particular topic by showing entities and their relations. I argued that without this contribution we would be somehow “spatially blind.” Maps enable us to answer space-related questions. Maps can be used to support spatial behaviour. I argued further, that in order to enable spatial thinking, spatial planning, spatial reasoning or decision making cartography is needed. I pointed out that maps are the most successful and powerful instruments to enable spatial awareness. If my arguments are trueg, then there is no need to step back or hide away as a cartographer but rather the other way around. It is of high importance that cartography and cartographers are actively contributing their skills, knowledge, methods and research to the geospatial domains. 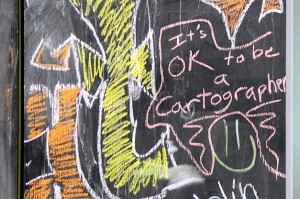 It is OK, to be a Cartographer! Well said, now only you have to convince the decision makers in the GIS industry that cartographers are needed. Unfortunately the contrary happens, everyone there thinks a GIS technician or Geographer is enough to produce maps and we cartographers are old-fashioned with our thinking of nice, accurate and well readable maps. More so when arguing that paper maps are still needed. I am happy to went through all the technics of making maps with a ruling pen and ink, negative scribing and all the “old stuff” during my four years apprenticeship, to learn about map design, map production, geography, theory of colours, thematic cartography etc. Only with what I learned there gives me the knowledge to use the mouse and the computer with all the sofware as modern cartographical tool. Today cartography is more science and technique, instead of aesthetics. No one is willing to pay for aesthetics. I agree with Markus that aesthetics aren’t valued in Cartography today. I just completed my Master’s degree and I often felt in the course of my study that the current goal of cartographic education is to develop tools to eliminate cartographers! Now I am applying to PhD programs and I am having a bit of an uphill battle convincing professors of ‘Geospatial Science’ that they would benefit from having someone on their staff who, while he may not be proficient in ArcGIS or the like, is able to walk into the field with a notepad and a compass and create a map that can illustrate scientific concepts or visualize phenomena which may not be visible. 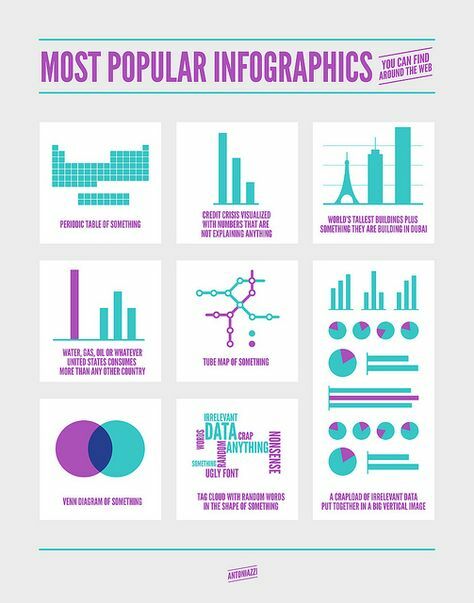 Depicting scientific information is as important a skill as gathering it. What good is research if the resultant knowledge is not disseminated? Isn’t that the goal and the value of Science itself? 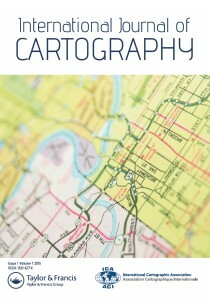 A Cartographer is more than a technician and we should not allow ourselves to lose sight of that fact. We at Esri, USA and as GIS company think differently. 1. We have a cartography module/course since worskstation ARC/INFO some 20 years ago. The current 2-day course is called “Designing Maps with ArcGIS” (http://training.esri.com/gateway/index.cfm?fa=catalog.courseDetail&CourseID=50127148_10.x). here we present the basic cartographic design primciples to our users who attend the course. 2. At the Esri International Users Conference we always had a Map Gallery where our users compete and get awarded for their excellence in cartographic design. 3. At the Esri International Users Conference and for 18 years I presented a 90 minutes workshop on “Basic Cartographic Design Principles”. It was only discontinued recently. 4. At the Esri International Users Conference and for the last 8 years I created a “Map Critique Station” where Esri cartographers would assist users bringing in their maps/atlases and constructively critique them for improvements. 6. I have taught the above mentioned cartography course as an additional activity with so many international conferences in recognition of the importance of supporting these conferences (including ICC conferences) and the attendees who also use our GIS software. Well said, and I very well remember the opening session here in Dresden. Angela Incampo and myself covered the five days on cartography, technology, art and its combination in real-time on Twitter (hashtag #iccDD2013). During the time we learned that cartography is greatly underrated to what it really brings to the table – may it be technology, education, arts or “just” bringing together different cultures on joint projects. To wrap up, I have to admit I am not a cartographer at all but everywhere I go in the world, the first thing I get (besides a decent tourist guide) is a local map, and I am most fond of what in Germany call “Topographische Karten” in a 1:50,000 or 1:25,000 frame. Georg was president of the ICA in the term 2011–2015. He is a Professor of Cartography at Vienna University of Technology, Austria.